They are ideal for a business traveller who wants quiet privacy along with the best amenities. Each room features a balcony and all the conveniences to cater to your comfort and business needs. These spacious, contemporary rooms are designed to make your business a relaxing one. 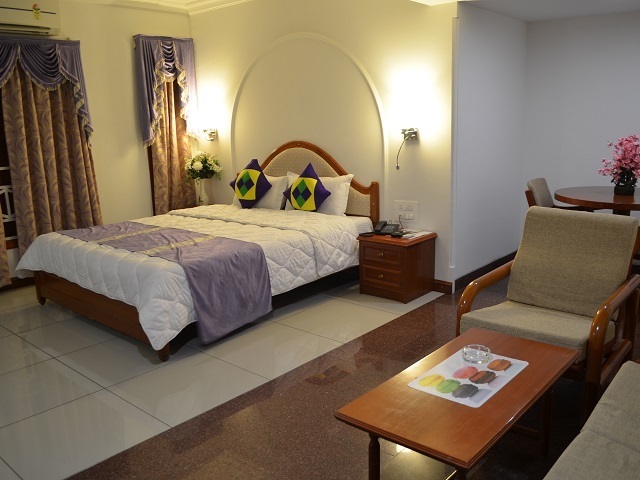 Each room features a City View balcony and all the conveniences to cater to your comfort and business needs. These rooms sport an bigger sitting area, bathtub and contemporary interiors.Each room features a City View balcony and all the conveniences to cater to your comfort and business needs. The suite is designed to help you relax and unwind. These rooms offer the best of amenities including dining table. Each room features a City View balcony. Room service is available around the clock at the Hotel Apex International, including breakfast deliveries and sandwiches/snacks throughout the night. Get Complementary Breakfast between 6.30 am to 10.30 am delivered at your room. Get Free WIFI connectivity in entire premises. Hotel Apex International provides you the comforts with a distinct difference that you will appreciate on your very first stay with us. Our corporate mission is to offer you an exceptionally personalized & friendly services & ensure you always retain your individual identity and never become just another guest. Making your visit to Vadodara a Memorable one indeed.